Having a leisurely breakfast when camping is a very civilised way to start the day. If you have the time (and desire) to have something apart from Weet-Bix or bacon and eggs on the barbie, then camping can be a great place to try something a little different. When I was looking at breakfast recipes to make, one thing that struck me (in a literal sense) was how many recipes, which are recommended for camping breakfasts, involve a lot of work and effort, plus they seem to be more suited for an evening meal than a breakfast. I don’t want to spend hours preparing breakfast at the campsite nor cleaning up. Who does? If you are the sort of camper, who does like labour-intensive meals when camping then that is great and keep on doing it! But for this story and for readers who want something more easily achievable. I have tried to avoid complicated breakfasts. Of course, if you want to keep these recipes in a free handy reference guide, you can get a PDF guide of all of these (plus a few extras). See end of story on how to do this! We have covered French Toast before, and you can read the story on how to make it and the variations on French Toast for camping. We listed 7 ways to enjoy this delicious breakfast. It’s a classic meal and also a great dessert (and we do love a good dessert). Really, anything you like can go on top of the Toast once it's cooked. Bananas and maple syrup work well, but whatever you have in the camping food box/esky. 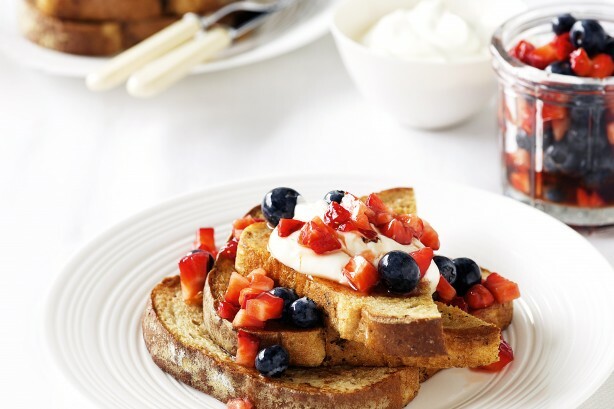 The basic recipe to create French Toast is at our story on French Toast - click here. I do like the look of the one below, from the website This Lil Piglet - it must be one of the most "pinned" recipes on Pinterest. Their recipe is calling for a product that we don't have here in Australia; it's like a pre-made French Toast Mix (the eggs and milk all combined in one carton). You could probably replicate using the French Toast basic recipe that we discuss in our first-ever French Toast guide. It's easy to make. 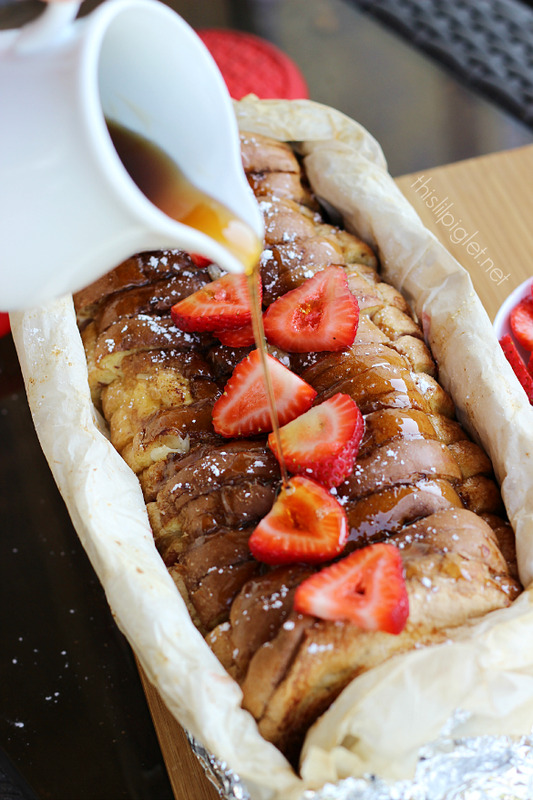 Just pour your mixture over the sliced loaf, sprinkling some almonds and strawberries between the slices and on top, and with great wrapping of foil, cook for about 35 minutes or so, moving frequently over the coals. If you do give this one a go, let us know how it went. 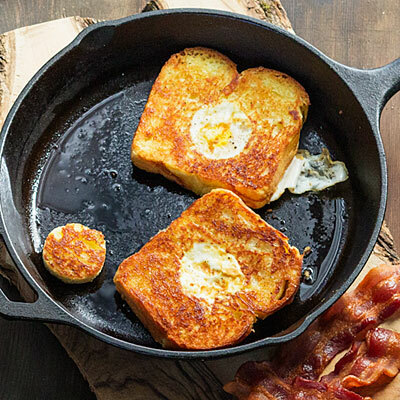 Yes, you can do some prep work with French Toast. You can make the dipping mix (eggs and milk) in advance. You can cook this breakfast on a camp stove with a frying pan, on BBQ hotplate or on a hotplate over a campfire. Another easy and simple camping breakfast. You can always serve bacon on the side if you need a bacon-fix. How you like your eggs will determine how long you cook each side. Season according to your taste. You could butter the bread and make the hole in the middle of the bread. Keep tightly wrapped until morning, refrigerated. I know. This sounds weird. But read on. Think of eggs on hash browns. That’s sort of what the idea behind this is. No idea on how healthy this is, but the crunch of the potato chips with runny yolks is a pretty good breakfast. This recipe is all over the internet in various forms, but here is the basic recipe. You will need a skillet/fry pan with a lid. The lid is crucial. Chilli (from a jar will do) and coriander – both optional, not mandatory. Cook up the chopped onion, ginger (and chilli if using) in your hot frypan/skillet on a medium heat. When the onion is slightly brown, you can add chopped coriander if you have at this point. Then place about 4 handfuls of crumbled potato chips into the frypan, and toss together. Even out the chips across the pan, and create indentations where you will crack the eggs into. Don’t worry if they are not perfect hollows for the eggs. You just want an indent where the egg will sit without running all over the place. Add 1 tablespoon of water down the inside of the pan (so not over the top of the food) and place the lid on. This allows the steaming to begin. Turn your pan down low. You cook the eggs until the whites are set. This might take about 6 minutes or so. You will need to check periodically that the eggs are set the way you like eggs! Once cooked, either eat from the pan or scoop cooked egg, with plenty of crunchy potato chips onto a plate. You need to cook with a frypan over a temperature you can control. So camp stove might be the best option. This idea has been around for ages. Some people love it. Others worry about cooking in a plastic bag and health consequences. It’s going to come down to your own personal decision – you need to make the call on using these bags. If the thought of cooking with plastic doesn’t appeal, then skip this recipe. For those of you with family members who all like something different, this recipe allows everyone to customise their own omelette. Grab a strong large ziplock bag. You want a good quality, STRONG one. Check that it’s suitable for microwave cooking, so you know it stands up to heat. The video above will give you an idea on how it all works. Chopped fillings of choice eg. mushrooms, ham, onions, tomatoes, corn, capsicum, whatever you like in an omelette. Crack the eggs into a large, resealable ziplock bag. Press out most of the air, and seal. Shake or squeeze the eggs inside the bag. Open the bag, and add the fillings you want in the omelette. In a large pot of boiling water, place your bag and any other bags into the water. Cook for 10 minutes. But, do check the eggs during the cooking process – say from 8 minutes onwards. The bags do float up a little, but don’t worry about that too much. I give them a nudge with a spoon occasionally to lower them into the water a little. If you are worried about your bag sliding down under the boiling water, and possibly getting water in the bag, then place a skewer across the top of the saucepan, and thread the bags onto the skewer. Or peg them onto the skewer with a clothes peg. That way, they are immersed in water, but not sliding down and not attaching to the side of the pot. I found a clothespeg, clipped them all together at the top worked fine. We have 4 bags in a pot. Once cooked to your liking, open the bag, and the omelette should be cooked and roll out onto your plate. Season with salt/pepper and serve with a chunky salsa (also available in a jar) or a relish (check out Berenberg relishes, a great South Australian brand – they are delicious with this) if required. Everything except the cooking of the omelette can be done the night before, and even before you leave home. With permanent markers, write the name of the person who has made the omelette on the bag, so everyone gets the right bag. Minimizes dramas and complaints at eating time. Keep the egg mixture in your esky until cooking. Wherever you can boil water in a large saucepan. Foil packet cooking is an easy mode of cooking, and we covered it all in our Beginner Guide to Foil Pack Cooking. If you haven’t read how to use foil packs, and seal them, then this is the guide you must read before you try this recipe. Now that you have read that guide (you have, right?) you can read the rest of this recipe. Once you know more about foil packs (all easy), then this recipe can be added to your cooking repertoire. 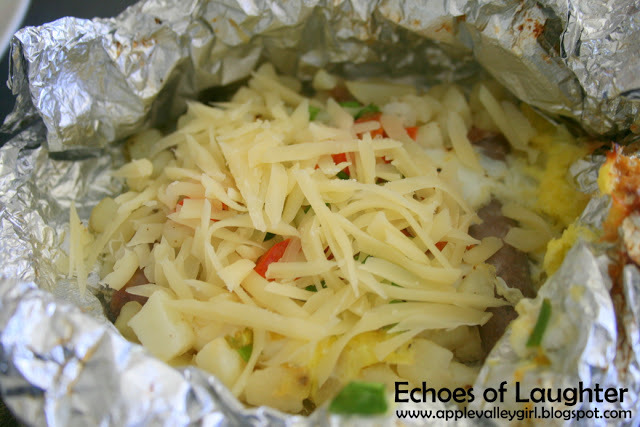 Using foil pack, it’s about putting all your breakfast in one parcel and cooking it. Simple. This recipe is about creating your own little foil pack, one that caters to your taste. For children, they can create their own parcel and hopefully, be more likely to eat it. On your greased foil pack, you add your selection of food (see above ingredients) – cooked bacon, hash browns, and any other ingredient, except the eggs and cheese. Wrap tightly and keep cool until you need. When ready to cook, you open you foil pack, and crack 1 or 2 eggs into it. You can add grated cheese at this point, or leave till last few minutes (which means reopening the foil pack, which can be annoying, so I would add it all at the same time as the eggs). Wrap up the foil pack again, so you won’t have spillage, and cook in coals or BBQ, or hotplate for 15-20 minutes. You need that bacon to be heated up to a safe eating temperature. The foil pack can be made at home as directed above. There will still be some minor additions on the day of cooking. Over coals, in a BBQ, on a hotplate or grill. Like the idea of a making your breakfast ahead of time? Then you will like this recipe. Similar to the Lumberjack and Omelette breakfasts, this is one you can make the day before you need it - make it at home, and the next morning at camp, voila! Your breakfast is all ready, and good to heat up. It sounds like a bit of work before you go home, but actually you are doing most of the cooking in 1 frypan. The method sounds like there is a lot to creating this meal, but there is not. Don't be too overwhelmed. Whisk in a bowl, all the eggs. Season with salt and pepper. Add 1 tsp of Old El Paso Seasoning (this will give it a little kick! Alternatively, you can add a dash of a hot sauce of your choice, depending on who will be eating the burritos). When the eggs are all frothy from whisking, set aside. Fry up the diced onion and bacon over medium heat. 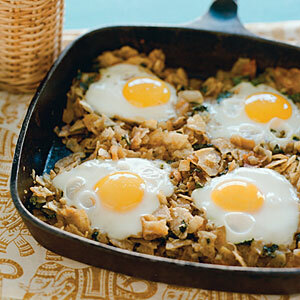 When nearly cooked, toss in the hash browns; you want this combination of ingredients to be cooked and lightly browned. So mix lightly so all flavours are combined. Add the eggs and stir gently until the eggs are cooked – you don't want them to be rock solid, just lightly set and scrambled. Not runny, though. The eggs cook quickly at this point, so keep an eye on them. Add the cheese and any other ingredients you might want to add (some people put in chopped tomatoes, chillies, herbs – it’s going to depend on what you have in the kitchen). Toss all ingredients over low heat. 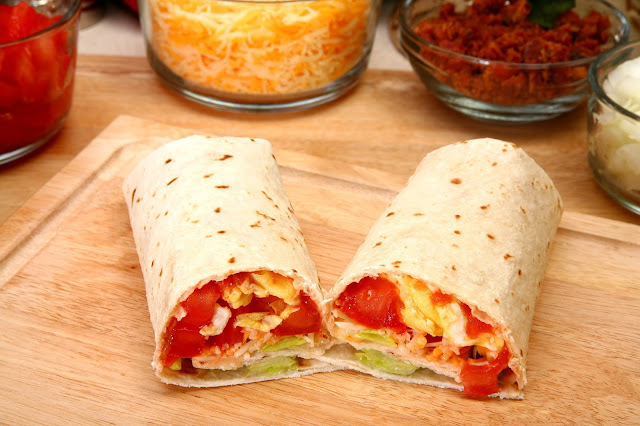 On a slightly warmed tortilla, place enough filling down the centre of the tortilla and wrap it up like you would any burrito. (If you don’t know how to wrap a burrito, and it’s really easy, just read this instruction page) If you have warmed your tortilla a little, you will find this easier. Wrap it tightly in foil, and then in a ziplock bag. Refrigerate until you need to reheat. Reheating at the campsite can be done – on a hotplate, in a frypan, in the campfire coals. Just turn the alfoil packets over regularly to ensure even heating and browning of the tortillas. Allow 15 minutes on average. Do it all before you leave home! Campfire coals, frypan, BBQ hotplate. This is a super fast breakfast (or lunch/dinner) – and one we make ahead. Very easy and low fuss, but you can adapt to suit your tastes and put in a lot more fillings like tomatoes, capsicums, bacon, variety of cheeses etc. Slice the croissants, and add the above fillings in the quantity you like within a croissant. Spread the inside of the croissant with mustard for added flavor (some children don’t like it, so skip this for them). Wrap tightly in foil. You can write names on the foil to help identify any croissants especially catering to fussy tastes. Cook in a BBQ (with a lid) or in coals of the campfire, or regular turning on a hotplate, until the cheese is starting to melt. Timing will depend on the method of heating you use but allow 15 minutes. The cheese should be starting to melt for optimum deliciousness! Don’t let the croissants burn, especially if cooking over coals. Additional information: You can add some greens in there once it is ready (if you have some available). Adding greens definitely makes you feel better about the fat content. Alternatively you can substitute the ham for cooked bacon. Do it all before you leave home! Keep cool until ready to eat. Food in jars has become a big thing lately. Everyone is sticking entire meals into jars. But for camping, there is a benefit to having a meal in a jar and great if you don’t want to be cooking in the morning. Some days you do need a quick start, and the recipes below are a healthy option too. You will need to be able to keep this jar cool though, like most of the make ahead recipes. You can get Mason Jars from Big W (sell in a set of 12) Cheap as Chips, Neds, Target. They have a wide opening, so a little different to say a coffee jar, or jam jar. The idea for this recipe comes from the website Iowa Girl Eats. By placing all of this into a large jar, layering the food. The yogurt is going to help soften the oats, so you will layer everything right up to the top of the jar. Then, refrigerate – and the contents last up to 3 days, so perfect for weekend camping. This is perfect if you don't like big, heavy breakfasts or eating in the morning. I know some people aren't hungry first thing in the morning, and want something lighter - and that is where a smoothie is a great option. I know my children frequently don't want to eat anything when they first get up, but they are always ready for a smoothie. You make this before you leave home, because a blender is required. A good one is a classic - Banana and Berry Smoothie. Blend, and pour into a freezer safe jar - only up to 3/4 full, as you need to leave room for freezing expansion. Then freeze. Take to the campsite and it will start to defrost in your esky/fridge over a day or two (depending on the weather). Shake before drinking. Of course if you want to have first day of camp, you don't need to freeze - but do shake it ferociously before drinking. 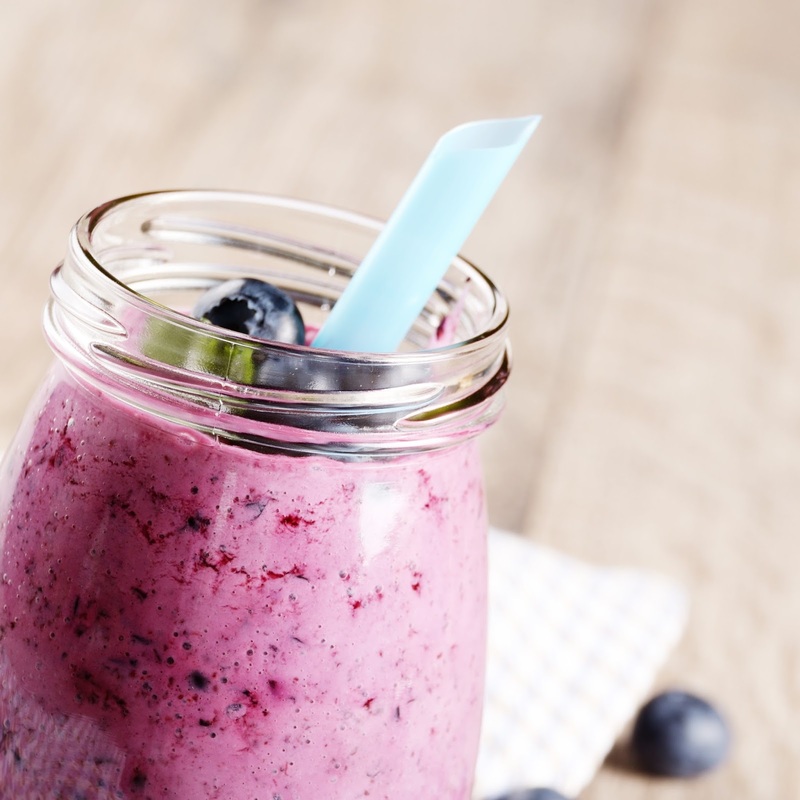 Do it all before you leave home and enjoy a healthy smoothie at camp - whether it be the first day or as soon as the drink defrosts. If you have fussy eaters, and those who don’t like breakfast anytime, anywhere, you may be able to tempt them with this as long as they don’t have a nut allergy. Nutella is not healthy. It’s high in sugar. But, it’s delicious and really, it makes everything taste good. So make this breakfast a camping treat (not an everyday meal). The beauty of this recipe is none of the ingredients need to be kept cool. Another plus (apart from the excuse to eat Nutella) - it's really fast to make, so if you are short for time, or packing up the campsite, it's easy to enjoy). Lightly spread Nutella on the tortilla. Place a peeled banana at the side of the tortilla and roll it up within the tortilla. 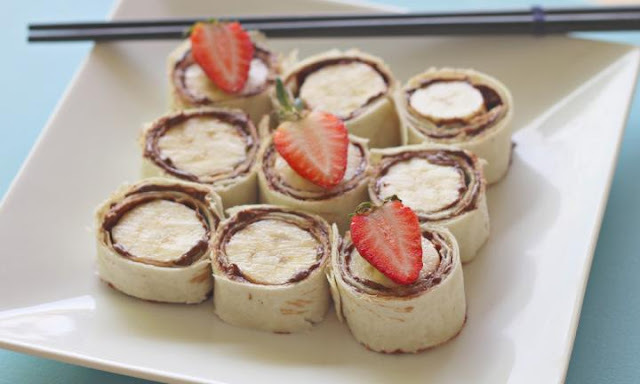 Slice the rolled banana tortilla, into 2-4cm slices. None – this is a 5 minute breakfast in the morning. This recipe seems to be one of the most popular on Pinterest. I have seen it everywhere, and it does appeal for its simplicity and it all belongs to the website Lady Behind The Curtain. So full credit to her for this idea. You need bacon and pancake mix (see our pancake information at the bottom of this story). Runny pancake mix is better. Maple Syrup needed to serve. Cook your bacon and set aside. 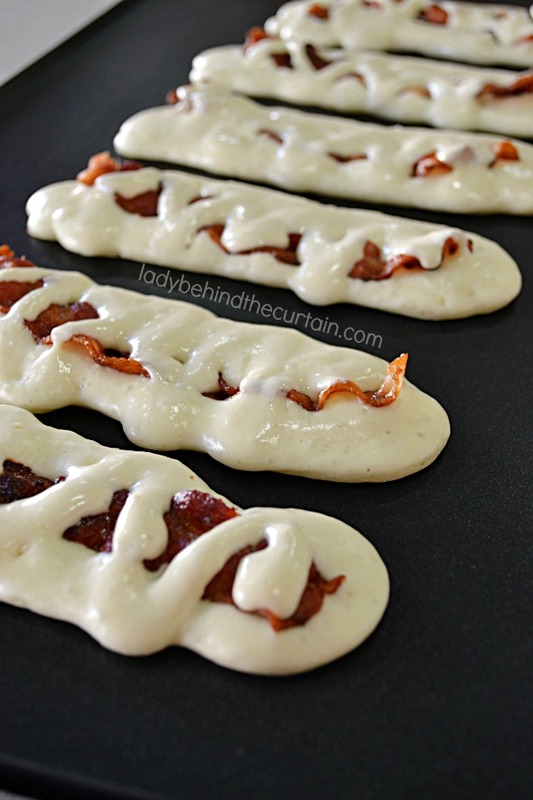 On your hotplate, pour your pancake mix in the rough shape of your bacon. Place your bacon on top of the pancake mixture which you have just poured. Let it cook for a little, and prior to flipping over, add more pancake mixture over the top of the bacon. Now flip and cook. When ready, serve with maple syrup. FYI: Maple Syrup on bacon is the best! The pancake mixture can be made the day before (or longer). You will need to cook on a hotplate or frypan. Keeping with the pancake theme, cooking a pancake in a camp oven is an option you may not have considered. Dutch ovens are fantastic for cooking, and we are not experts with them at all! You need to read Cast Iron Boys website if you need expert advice on all things dutch oven/camp oven. For breakfast and cooking with a camp oven, this means someone has to get up a bit early and get the campfire going, and have coals ready to go for this recipe. So, its not a really fast recipe to have in the morning, as you do need to factor in the heating time. On the positive side, this makes a great dessert, so you might choose to have it for your evening meal! 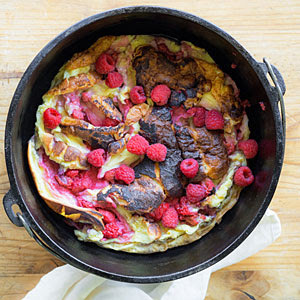 This recipe is about cooking 1 oversized pancake, and adding fruit of your choice into the pancake. Like berries (of any sort). But really, you can have this pancake with maple syrup, or jam, or lemon and sugar. Mix all the dry ingredients together at home. When its time to start cooking, you need to add the wet ingredients to the dry ingredients (have the eggs out of the esky for a while, you don’t want them very cold) and whisk like crazy. You want lump free mixture. Still got lumps? Whisk harder and faster. When your dutch oven is heated (so your coals are ready for placing on top of the camp oven lid), add a 2-3 tablespoon of butter to the oven and swirl it around the bottom of the pan. You want the camp oven greased, and hot. Pour in your lump-free mixture into the hot camp oven, just pour it in, don’t stir and add berries to top (if using) and cover with a lid (and coals). It’s cooked when there is no liquid, check the centre of the pancake. The edges will be golden and starting to crisp up. Start checking from 15 minutes onwards. The pancake will rise in the camp oven, and be all fluffy. BUT… the minute you take it off the heat, it deflates. Don’t be surprised or stressed when this happens. You can eat from the camp oven, or serve onto plates with more fruit. Or if you don’t have the fruit handy, lemon and sugar still remains a classic option. The pancake dry ingredients are made before you leave home. You will add the wet ingredients prior to eating. In a camp oven, over hot coals. Aiming for a temperature around 220 degrees. Jaffles or Pie Irons have so many choices of fillings. For breakfast, lunch, dinner or dessert, there is a jaffle for everyone. But for breakfast, what can you put in them? Here are some suggestions using the traditional buttered bread on the outside – just add the fillings (quantities are as much as you can fit in the jaffle and still close it). You can butter the bread ready for the jaffle mix to be added in the morning. In the campfire, in a jaffle iron maker. Alternatively, you can fry them up in a frypan or on a hotplate. 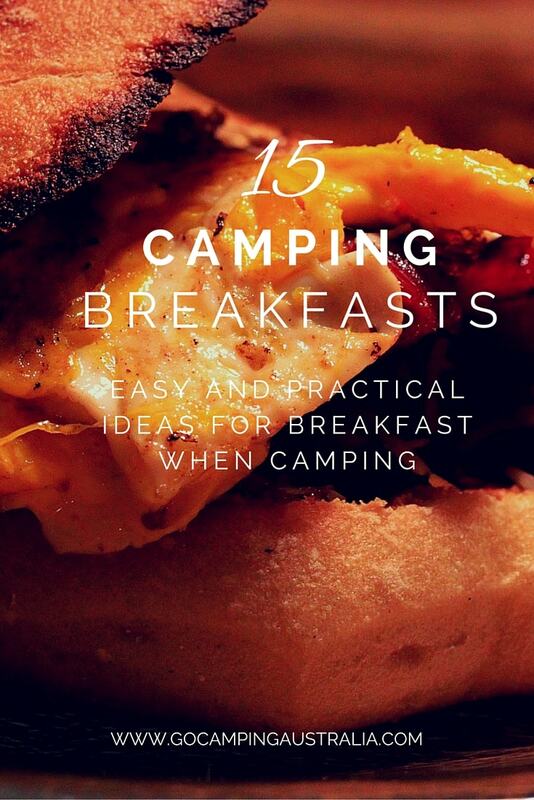 This can be made ahead, and therefore it makes our easy camping breakfast list. But, if you are a bit worried about soggy bread, then it's one for the campsite. FYI - It's a good one for a Sunday night at home! For every roll you are using, you slice off the top (set aside, you will need it again) and remove the inside bread, making sure you leave the roll's sides intact and firm. 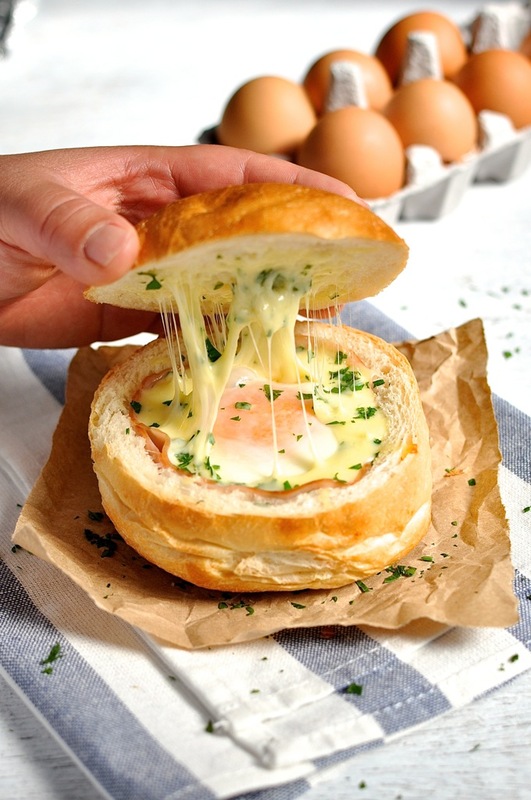 If you are going to put them in the campfire immediately, you line the inside of the bread with ham slices, and break 1 egg into the roll. Sprinkle with 2 tablespoons of mozzarella, and then replace the top of the bread (that you set aside in the beginning). Wrap with foil and cook on hot coals, but not right in the middle of the campfire, for about 10-15 minutes depending on the way you like your eggs. Like a lot of campfire cooking, this takes a bit of practice to get right. If you have made in advance, then it's very important to make sure that the lining of ham inside the roll is well done, otherwise you will have oozing eggs and soggy bread. Gross. Like all food in foil, wrap it well so it doesn't tear in the fire, and no ash seeps in. You can add anything you like on top of the ham. All preparation can be done night before or prior to leaving home. The longer you leave though, the greater the chance that the eggs could seep into the bread. On a BBQ with a lid (ideal) or over campfire coals. If at home - in the hot oven. Muffin tins can do more than make muffins. They are an easy way to serve a crowd (camping or at home). 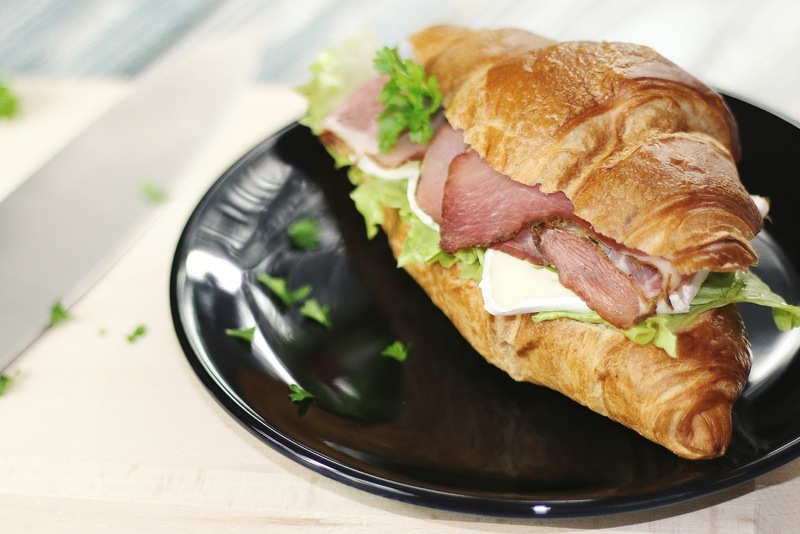 Like the previous recipe, it's using ham and eggs, but you can make it even more original based on the ingredients you have around the place. Ensure you have a heat source with a grill or a BBQ with a lid (heat to about 200 degrees). If doing over a campfire, you will not want a raging fire, so elevate the grill above the flames. Position 1 slice of ham in each of the muffin cups, doubling each slice over to ensure that there are no holes in the bottom of the ham "cups." Sprinkle 1/2 tablespoon of the cheese and 1/2 tablespoon of chopped spring onions (if you have). Place one raw egg in each ham cup. Sprinkle each egg lightly with pepper. Cook until the egg is done to your personal liking. Placing alfoil or a baking tray over the muffin tin will help speed up the cooking time. Remove carefully from the muffin tin! This recipe gets altered a bit - you can line the muffin tin with bacon and then add eggs (classic combo). You can line the tin with flattened bread and put toppings on top of the bread. I couldn’t do a breakfast story and not include pancakes. 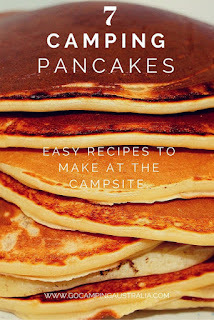 One of the easiest recipes of them all and probably something you are already making when camping. You may go to the supermarket, and buy one of those shaker bottles, which only need water added to make your pancakes. You may choose to make the traditional method or the fuss free shaker mix version - with all dry ingredients prepared for you leave. This was one of our key points we discussed in preparing your food for a camping trip (beginner guide), as not only does it save time, but saves space if you do it before you leave home. But there is SO much to say about pancakes, that we did a story on 7 pancake recipes. You can see these 7 pancake recipes, plus the way to make your own shaker mix, right here. If you need gluten-free pancake mix, try this gluten free pancake mix. You can make the whole recipe the night before, and refrigerate until required. 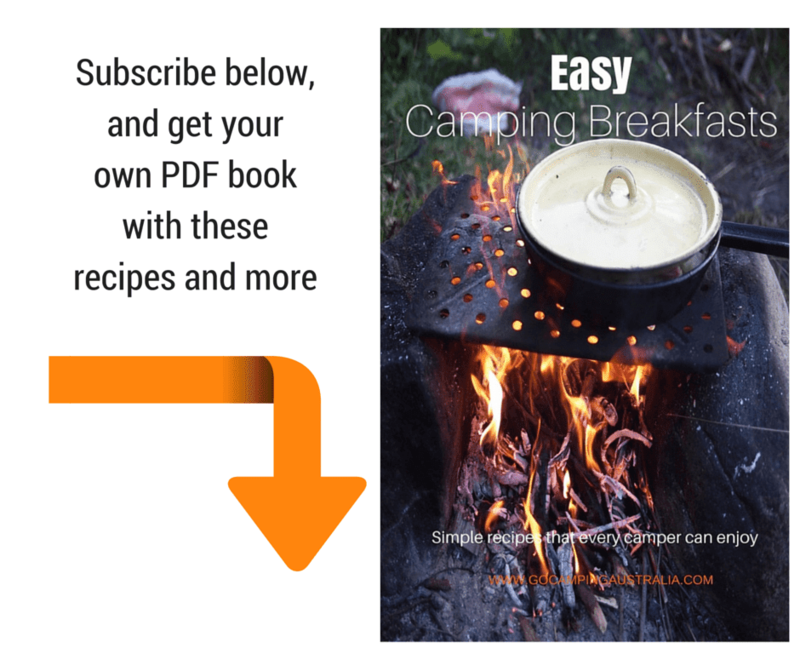 We hope that you try one or all of the above camping recipes on your next camping trip and don't forget to sign up to get a booklet on camping breakfasts - for free! !